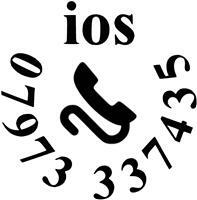 Ian Osman Services ios - Telecommunications based in Bournemouth, Dorset. Welcome to Ian Osman Services ios. I am a TRAINED TELEPHONE ENGINEER with 25+ years’ experience in the Telecoms industry. Flexible working hours to suit around you; if you would only be available on weekdays after 6pm or weekends we would be happy to suit our services around you. Available for testing and diagnosing (within your property's boundary) of faults on ALL DOMESTIC AND BUSINESS Telephone lines, Analog ISDN2 & Internet Connections, ADSL ftc/vdsl (all test equipment available for testing) or do you have a suspect damaged cable damaged sockets or are you just not getting anywhere with your ISP/Service Provider? Or don't understand what they are saying and just need some advice? Network cat5 cabling tested and diagnosed for possible faults. Main incoming sockets repositioned and cabling tidy up. So if you have any problem telecom/internet wise then get in touch. I am also Toshiba trained on all Toshiba DK/CTX/CIX Business Phone Systems with spares and complete Telephone Systems stocked ready to install.